New Zealand has had a stellar run from Tuesday's data release. Unemployment levels have reached a ten year low at 3.9%. See the chart below. This was an unexpected fall with market expectation of 4.4%. The key labour data looked like this. The Policy assessment summary from the release statement felt like a little more upbeat than might otherwise have been expected. You can read it here below. 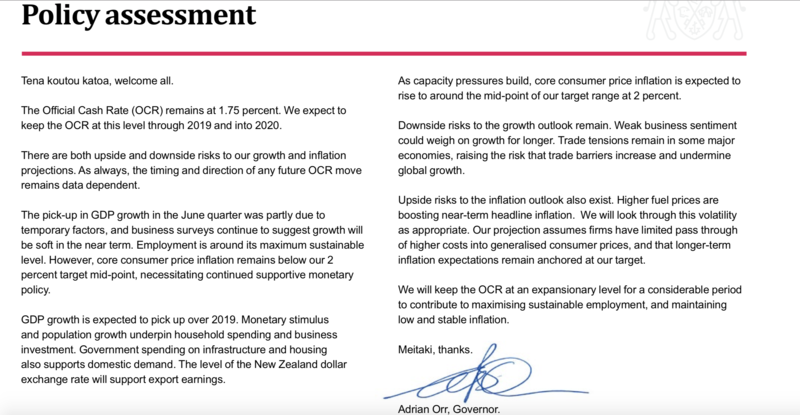 GDP is expected to rise and Orr said that he would consider a rate cut if GDP fell short of projections. ( So take a mental note that GDP data is key for the NZD going forward - next GDP release is December 19). Therefore, given the fact that GDP is expected to increase and inflation data is expected to rise as well, there is a shift of bias from expected dovish to cautiously watching the data. To me this is a shift, albeit tentative positive notes, and buying NZD dips makes sense. I like a NZD long swing trade. Also take note that the bank is focusing on weaker business sentiment as a risk factor going forward. If that dissipates then we may see more optimism return for the NZD. EUR/NZD Short looks good pairing the negative EURO growth story with a more upbeat/ less bearish RBNZ. Look to enter at the 100 or 200 EMA on the 1 hourly chart. 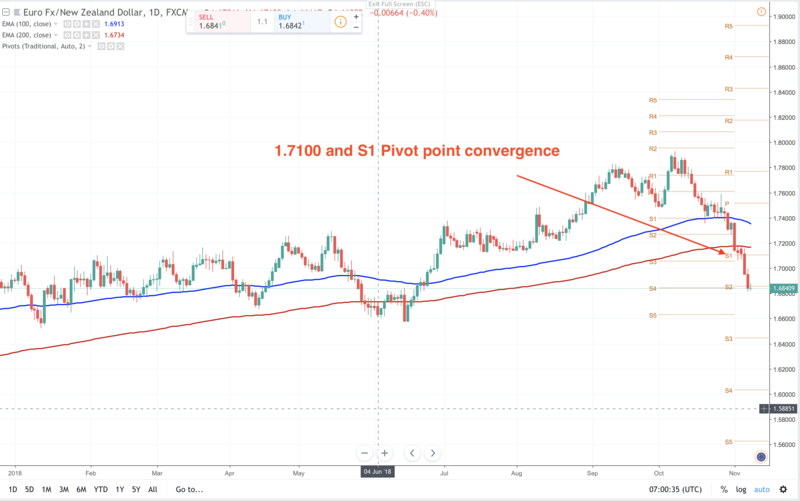 The S1 Daily pivot and 1.7100 convergence level is my preferred entry level.